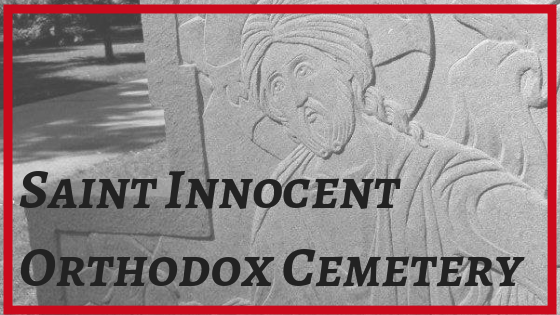 St. Innocent Orthodox Church - Our Orthodox Christian Cemetery in Macon, Georgia is a ministry to the living and the dead. "Man is sublime when he cares for the living; Man is more than sublime when he cares for the dead. A man often cares for the living out of selfishness. But what selfishness can there be in a man’s caring for the dead? Can the dead pay him, or express their gratitude? Some animals bury their dead; giving them to the grave, they give them over to forgetfulness. But when a living man buries a dead one, he buries a part of himself with the dead man and returns home carrying a part of the dead man in his soul. This is especially clear – terribly clear –when a kinsman buries a kinsman, and a friend a friend. Death has one characteristic in common with love: it, like love, works a profound change in many that experience it and go on living." 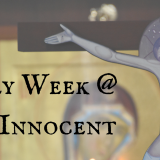 Check out our virtual church tour by Orthodox 360. 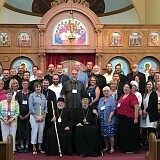 On Saturday and Sunday, September 3/4, St. Innocent Orthodox Church celebrated 20 years since our founding in Macon, GA. His Grace Bishop Alexander was with us for the celebration. On Saturday we started with a Moleben of Thanksgiving followed by an informal get together and finished with Great Vespers. 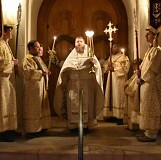 On Sunday we served the Hierarchial Liturgy. Three readers were tonsured and a Diocesan Gromata was given. It was a beautiful weekend. May God continue to grow and establish our humble church! Fr. Theophan and Molly Croft participated in the Small Parish Forum in Toledo, OH.